ALM Octane can be used with whichever development methodology your teams use. If your team uses the Agile methodology, use ALM Octane to manage the development process. This process repeats with continuous delivery of your application. The first step in any Agile development involves planning. Because Agile focuses on continuous delivery, clear planning is essential. How backlog items proceed through the development cycle. This ensures that all parties work with the same process. How an item moves to completion ("Done is Done"). Specify rules for completion of a phase, when an item is complete, and so on. For details on setting workflow phases, see Set up workflow phases and transitions. For details on using rules, see Set up rules. To commit to completing work, you need to know how much work a team or individual can finish. The expected velocity for the team. This number can be dynamic over time. For details on planning velocity and capacity, see Manage velocity and capacity. Before and throughout the development process, the product owner maintains the product backlog. The Backlog is fluid and adjusts to changing priorities. For details on using the Backlog, see Backlog management. While maintaining the Backlog, the product manager ranks Backlog items. Correct rank ensures that development teams select the highest priority items when planning. Rank is displayed in Backlog lists or grids. Change the rank by dragging and dropping items within the list or grid. Manually enter the rank in the Rank column. For details on ranking, see Rank the Backlog. For details on WSJF fields, see Rank with WSJF attributes. After you create the Backlog, plan each release and sprints. For details on working with release and team assignments, see Plan your release. For details on the release buckets, see Use the backlog planning buckets. During the sprint planning meeting, assign work items to a user. For details on managing a team's backlog, see Manage the team backlog. For details on the team planning buckets, see Team planning buckets. As you work, it is important to update progress. This is especially true if you use daily scrum meetings where you discuss what was done and what to do next. Updating the item's phase ensures you have an accurate reflection of progress. For details on workflow phases, see Advance the phase of an item. From the Tasks tab of the Team Backlog module. For details on managing tasks, see Work on your stories. In the Team Backlog module, view the Team Progress graph or individual team member bucket. In the Team Backlog module, set limits on the number of items in progress for a phase (WIP limit) and on the number of days an item can be in a phase (cycle time limit). Each phase in the Board View displays continuously updated information on the number of items in progress and if any items are past their cycle time limit. Create custom graphs in the Dashboard module. 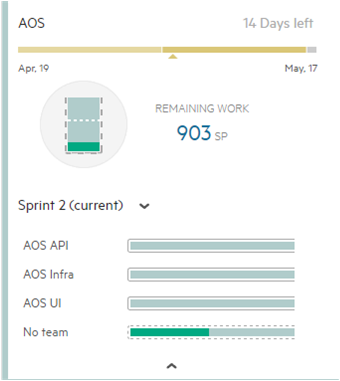 Later in the release, add the Release Forecast widget to the Dashboard to see how ALM Octane predicts you will finish the planned Backlog items. For details on tracking release progress, see Analyze release progress. For details on the Dashboard, see Use the ALM Octane Dashboard. For details on the Board View, see Use the Board View. Check overall release progress for each team and its team members. For each backlog item (including epics and features), add tests. For details on adding tests, see Create manual tests or Create Gherkin tests. For details, see Run manual and Gherkin tests and Run automated tests from ALM Octane. An important of testing is ensuring new features do not break existing functionality. To do this, add tests to your CI server builds. Then create a pipeline in ALM Octane that represents the steps of the build. When the pipeline and build run, view the details and results of the build jobs and tests. For details, see CI Pipelines. After running a test, view the test results. For manual and Gherkin tests or automated tests included in a pipeline, ALM Octane displays the test results in the test run. For tests run outside ALM Octane upload test results to ALM Octane. Once the test results are available, view the results directly inside the ALM Octane test. For details, see Stop the run and see results, Send automated test run results to ALM Octane, or Analyze automated test run results. If you find issues or errors in your application, open defects to resolve these issues. This lets you use the errors and issues to improve the development quality. Furthermore, add the defects to the Backlog to include the defect in release planning. For details on adding defects, see Report and track product defects or Report defects during a run. As you develop, check the application's quality. This information is displayed according to test results and defects. Analyze the quality of the current release. Filter the widgets in the Overview tab of the Backlog and Quality modules by release. For details on configuring dashboard widgets, see Use the ALM Octane Dashboard. After you decide you have completed all assigned backlog items, you are ready to release the application to customers. Use the feedback from these releases to inform future planning. Hold a retrospective to present what was done and review the release or sprint. In the Team Backlog module, use the Retrospective area to summarize the sprint or release and address unfinished items. For details on the retrospective area, see Perform sprint closure and retrospective. If your team uses a traditional development methodology, such as waterfall, use ALM Octane to manage the development process. Requirements: List the requirements of what the product needs to do. This may or may not include a list of features. Design: Define how the requirements work inside the product. Testing/Verification: The quality assurance team tests and verifies the planned features. Open defects for those problems encountered in testing. Release/maintenance: Release the finished and approved product. We recognize that not all traditional software development models follow such a linear progression, However, these framework do keep a rigid separation between development phases. In traditional software development, you define the requirements before beginning any work. This lets you know exactly what your product needs to do for customers. Also, you define the timeline and resources to see what it is possible to finish..
ALM Octane lets you do this planning before beginning work on the release. When beginning development, you have a general idea of what the application should do. You may know what tasks the application can perform, what things the user may want to do, and so forth. To help define requirements, use the Requirements module to describe the intended functionality. For details, see Requirement management. While adding requirements, create application modules. These application modules are functional areas of the product. Application modules enable you to see application health and progress as you proceed through development and testing. Create and view application modules in the Quality module. After you create the application module hierarchy, associate features, tests, and defects with each application module. For details on application modules, see Quality management. Create the timelines for the product releases. For details on defining releases and release timelines, see Set up a release. For details on creating and assigning teams, see Manage teams. Once you have planned requirements, releases, and teams, begin developing the application. This involves creating the backlog of work items and assigning these work items. First, create the product backlog to organize the development process. For details on working with the release and team assignments, see Plan your release. For details on the release buckets, see Use the backlog planning buckets. For details on tracking release progress, see Analyze release progress. For details on the Dashboard, see Use the ALM Octane Dashboard. Add widgets to the Dashboard, such as the Stories Cumulative Flow graph, Burn Up and Burn Down widgets, and so on. For details on running tests, see Run manual and Gherkin tests and Run automated tests from ALM Octane. Create dashboard widgets for past releases of the product to see the quality of that release.